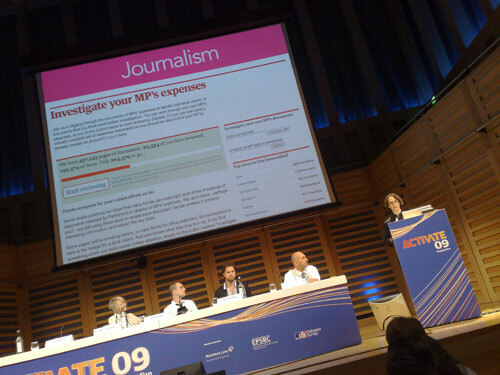 This time last week I was gearing up to attend The Guardian's first Activate summit at Kings Place. I've blogged about Gerry Jackson's heart-breaking mission to get independent news into Zimbabwe, Nick Bostrom's presentation about 'the end of the world', a politics panel featuring Tom Watson and Adam Afriyie, and the thread of data release and story-telling that ran through the day. I wanted to conclude with a final set of observations about what had caught my eye, made me laugh, and given me pause for thought. Richard Baraniuk was talking about cnx.org, and the way that 'open source' education text books were making headway in the USA. It was full of facts and figures about niche long-tail educational publishing, and how the price of text books had out-stripped inflation by some margin. Most importantly for me, finally someone put some pictures of Lego up on the big screen. It gave me another cause to think about our UK-centric regulatory framework. You'll recall that the Government approved the BBC's digital curriculum plans, waited until they'd spent a large chunk of the £400m earmarked for the project - a lot of which was going to independent producers - and then the BBC Trust canned BBC Jam because it was competing with the commercial educational resources market. A couple of years down the line, and we find that the US Government is sponsoring open source text-books that look like they will decimate that market in any place. "I think the easiest way anyone has found so far of releasing govmt data is to leave USB keys lying around"
After it was retweeted a few times, I subsequently found myself on the receiving end of a gentle scolding from William Heath. Appearing on a later panel, he was rightly making the important distinction that it has usually been personal data lost by civil servants, rather than the useful framework data that we are keen to see released into the wild. There was an interesting debate about whether an incoming Conservative administration would allow civil servants access to social media in order to be more open about what they are doing. Adam Afriyie was clear that where the purpose of a civil servant role was to inform the public about services, then social media had a role to play, but he didn't think everybody in the civil service should be tweeting all day. There was something deliciously ironic about the fact that just as a possible future Government minister was announcing that Facebook and Twitter did have a role to play in the running of the state, Johnston Press were apparently banning their journalists from using them. 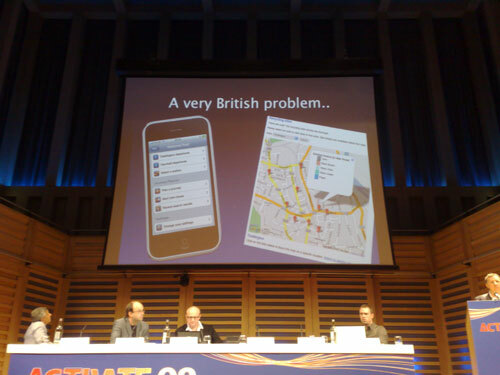 Ed Parsons is a geospatial technologist at Google, and he was talking about mapping applications. The UK has some peculiarities around map data, so, for example, it seems that annotating a map with the location of recycling centres breaches map-holder copyright, even though the original map doesn't actually show the recycling centres. Ed also made one of the fundamental generational points of the day - introducing his 12 year old daughter on a slide and describing her as one of the 'not lost' generation. He believes that thanks to her (pink) mobile phone, GPS technology and ubiquitous data connectivity, she'll never know what it is like to feel lost. Although I'd argue that if she ever tries to get a decent 3G signal on a train from London to Manchester in the next couple of years she'll soon rediscover that ancient mariner feeling. One thing struck me about Ed's slide deck. It must be irksome talking about mobile device geo-location and having to pimp the prowess of Apple's iPhone all the time. I noted that every single shot of an Apple product was offset with a picture of either an Android handset or a Google app. Talking of Google, Bradley Horowitz closed the day with what could be described as a mantra for the future. He said that the internet will be faster and more ubiquitous, and in airplanes and in tunnels. Advertising will have to transform, as we will not have the patience to endure it. Every bit of data will be automatically tagged with geo-data or sensory data. We will be able to record every single moment of our lives, but we won't get a second one to play them back. The bottleneck in the future won't be bandwidth or technology, but the finite number of moments in our lives. While he was saying all this, the day was experiencing the only major technical failure itself, as it wasn't possible to bring his slides up on the screen. Personally, I was rather relieved that the curse of the Kings Place A/V failure could strike people who'd put on a much bigger event than something like a London IA Mini. It was a very intense day that I found tremendously inspiring. As I blogged yesterday, there was a juxtaposition of 'amazing tech achievement' with 'amazing developing world need' that kept technophiles like myself more grounded about the jetpac future than I would usually be at a conference like that. The reality is that what we nowadays consider simple electronic and computational technology can assist developing societies in ways that we utterly take for granted. 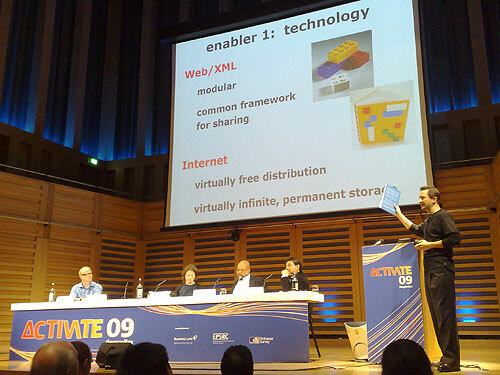 Videos from Activate 09 will be up on The Guardian's site over the next few weeks, and at the end of the day Mike Bracken announced that The Guardian was intending to hold Activate 10. I hope be there. By Martin Belam on 8 July 2009.